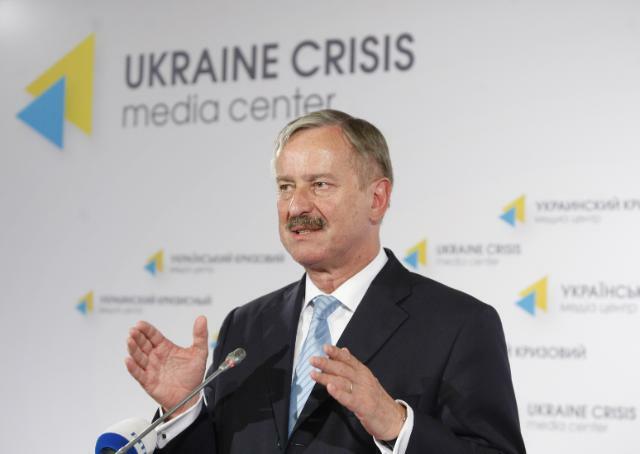 Siim Kallas, vice-president of the European Commission, came to Kyiv on May 19 to announce the disbursement of the first part of the EU’s macro-financial assistance package. Read below the details of his briefing at the Ukraine Crisis Media Centre. On EU macro-financial assistance (MFA): Our current efforts are focused on providing exceptional macro-financial assistance worth €1.6 billion in long-term low-interest loans. The first disbursement worth €100 million was provided today, [on May 19]. The second tranche, worth €500 million, will be dispersed soon, because I learned today that the Ukrainian Parliament has completed ratification of the memorandum of understanding and the loan agreement. According to our schedule, we will disburse the funds in June or July of this year. Provided that Ukraine implements the agreed-upon reforms effectively, we expect to disperse the whole €1.6 billion over the course of this year. On the purpose of the MFA: This MFA is designed to help Ukraine cover part of its external financial needs, reducing its negative balance of payments and fiscal vulnerability. The MFA is intended to underpin the economic stabilisation programme recently launched by the Ukrainian administration and to improve the transparency of government practices. The memorandums of understanding precisely describe the conditions for the disbursement; the last of these memorandums was signed on May 13. But we don’t specify precisely for which budget lines the money will be used. The general idea is to support the Ukrainian government to cover the expenses associated with reforms. As the country has to implement significant changes in its financial management, there will be definitely gaps. These funds will be provided to cover those gaps. Of course, the memorandum describes in detail how these funds must be monitored and reported. On state-building assistance. In the very near future, the EU will provide Ukraine with a budget support grant worth €250 million through the state-building contract. The contract as a whole is worth €355 million. The main objective of this assistance is to promote good government practices, more government accountability, and inclusive social and economic development. In my experience, [state-building and good governance reform] usually starts with the legal environment, ensuring a fair judiciary, better tax collection, transparency, and public procurement rules, and fight against obscure deals, i.e. all the measures that make citizens and businesses feel that they are being treated fairly. I have been asked numerous times what the most important reform has been in my own country [Estonia], and I have always answered that it has been legal reform. The legal system must function properly. Fair and simple taxes also play an important role: taxes can be lower but collected more effectively. Tax evasion is a challenge that must be overcome. On broader EU assistance. All this assistance is part of the broader €11 billion finance package announced by the European Commission in March. The package includes substantial additional support. For example, the European Investment Bank is providing up to €3 billion over three years.